Conan - From Warrior to King! It's the Age of CONAN! 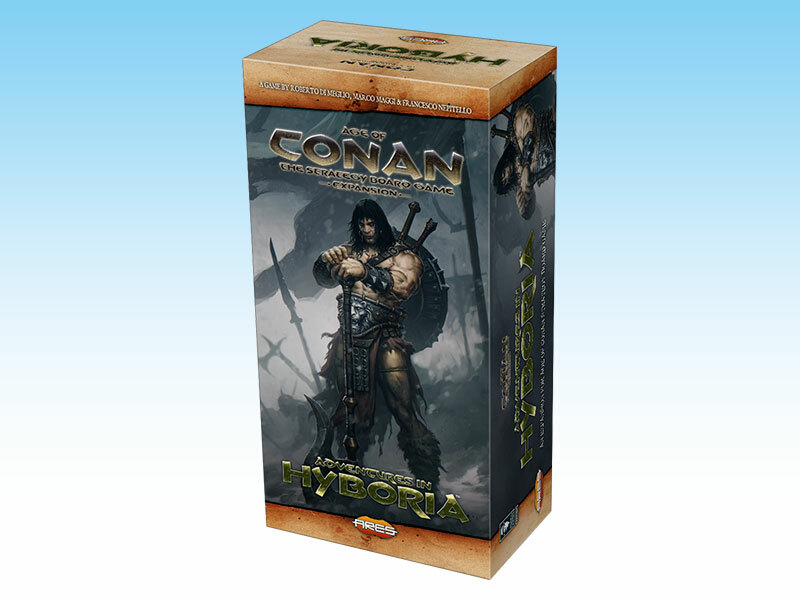 Adventures in Hyboria is an expansion of Age of Conan Strategy Board Game designed to improve and expand the role of Conan in the game. It adds a new dimension to his adventures: Conan's stature grows from warrior and thief, to general, and finally, king. His abilities grow as well, making his presence in the game more visceral and more important. Adventures in Hyboria adds other new mechanics and game elements. The Hyborian Age is not a time of all-out conflict, and the game includes several paths to victory beside warfare. This remains true in Adventures in Hyboria. The expansion opens more opportunities for player-vs-player conflict, such as, for example, the new rules for Spies and Prisoners. A copy of Age of Conan Strategy Board Game is required to use this product. Conan's effect on the game varies as he develops from Warrior to King: A different special die is associated to each stage, to be rolled whenever Conan is involved. The dice also includes new results, like "Gold" (Conan needs gold to be hired) or "No Sorcery". Story Cards add a greater level of detail to Conan's adventures, and add a new level of interaction. In Adventures in Hyboria, each player has a hand of Story Cards. As Conan travels across the land, you may play a Story Card as soon as he's in an appropriate location. Then, you try to complete the Story, using the new mechanics (Conan's stats and mood). If you are successful, not only you reap the rewards, but you also have a chance to take control of the Barbarian away from the current Conan player. From Taurus to Valeria, from Bêlit to Juma, many of the best Conan stories feature great characters fighting alongside the Barbarian. Now these characters are also featured in the game, appearing during an adventure and used to specific effects (normally to help Conan during a Story). Often, wars are not won with armies alone, and Hyboria is far from an exception! Spies are a new playing piece available to Kingdoms. At the beginning of an age, they are spread out all across Hyboria. The presence of a spy can help your chances to conquer a Province, forge an alliance, or hinder the attempt of your enemies to do the same. Slavery and ransomed hostages are common occurrences in Hyboria, and the rules for Prisoners are meant to represent this. The possibility of ransoming back your defeated troops and exchanging prisoners means the loss in player-vs-player conflict is less punishing than before, especially in multi-player games, adding yet another level of player interaction. Kingdom Cards give each player the ability to "break the rules", providing each Kingdom a unique gameplay flavor. With many new mechanics added by Adventures in Hyboria, new Kingdom cards allow players to manipulate them and further differentiate the abilities of Aquilonia, Hyperborea, Stygia and Turan.